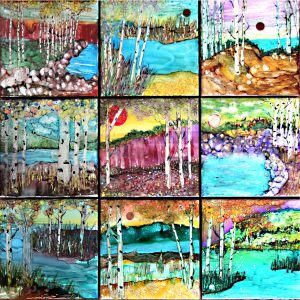 This one-day workshop illustrates the ease and fun of creating your own custom ceramic tiles for back splashes, kitchen and bathroom accents, trivets, coasters or wall hangings. Alcohol ink dyes has an isopropyl (rubbing) alcohol base and can be manipulated in fascinating and unpredictable ways when mixed with other liquid mediums when applied to a porous surface. All tools, materials and handouts are included. No experience necessary. 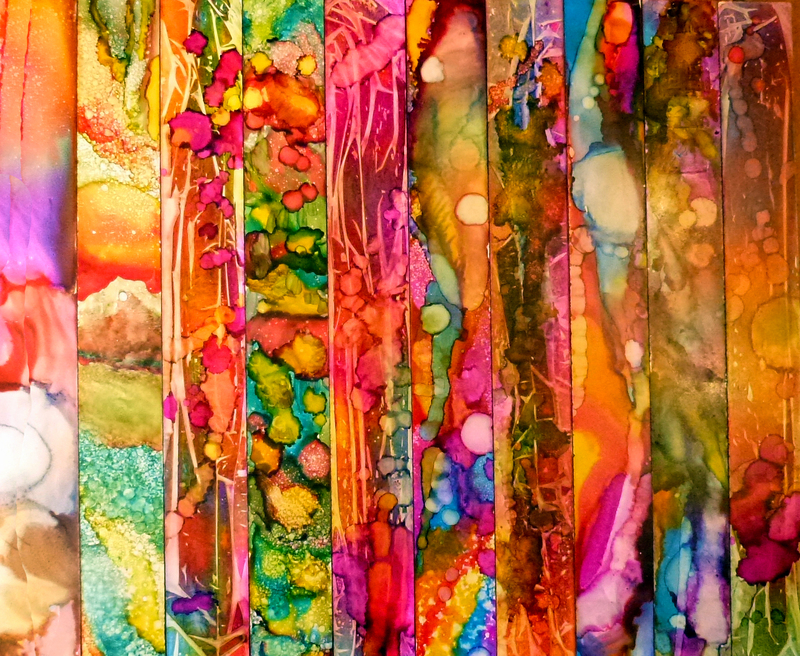 ADVANCED: If you enjoyed the alcohol ink tile workshop, this one-day workshop delves further into the world of alcohol ink substrates. Yupo is an acid free, polystyrene tree-friendly paper recommended for larger works. If you have mastered the ceramic tile substrate, this material is lighter and may be framed or mounted on a backing. The inks react almost the same, but with shorter drying time. All tools, materials and handouts are included. Basic knowledge of this medium is necessary. Recycle your glass vases from past floral arrangements, yard sales or thrift shops. 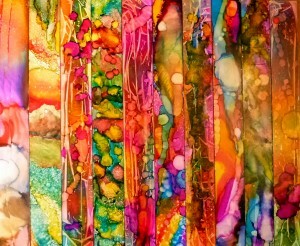 Bring them along to create items for beautiful, usable artsy gifts using Alcohol inks and primer. 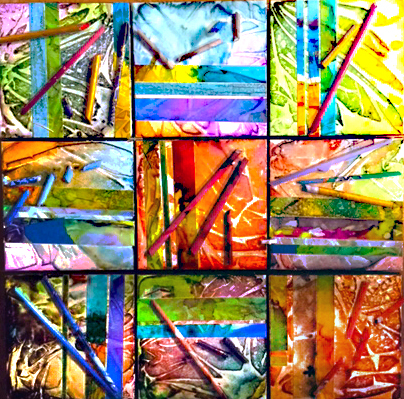 These inks have an isopropyl (rubbing) alcohol base and can be manipulated in fascinating and unpredictable ways when applied to a non-porous surface. Easy and a lot of fun to create! Previous alcohol ink experience unnecessary but helpful. Bring a number of glass vases of any color. 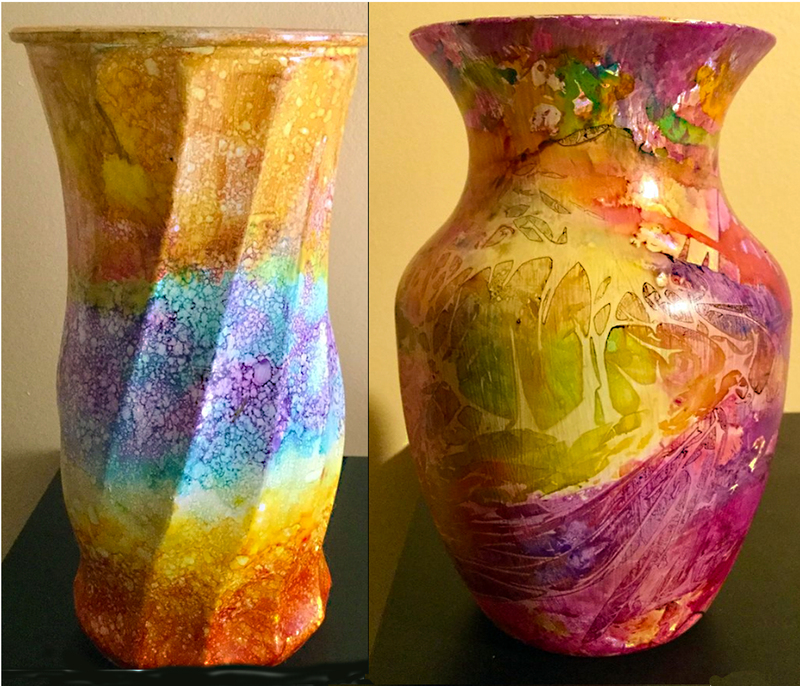 You can customize a vase for your home or to give as a fun and colorful gift! If you enjoyed the alcohol ink tile workshop, come delve further into the world of alcohol ink substrates and the joy of collage. We will be incorporating Yupo, an acid free, polystyrene tree-friendly paper recommended for larger works. The inks react almost the same way on Yupo, but with shorter drying time. 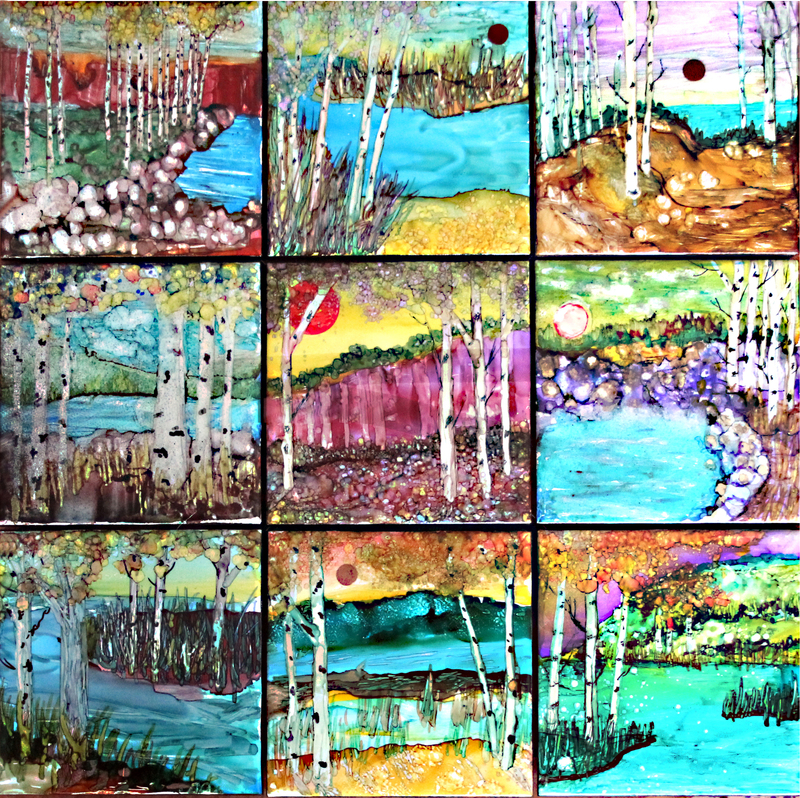 We will paint, cut, roll, place, paste, and glaze to create colorful ceramic tiles suitable for further collaging and hanging. All tools, materials and handouts are included. Bring some colorful magazines for rolling. Basic knowledge of this medium is helpful, but not required. Reserve your party for this outstanding workshop early, due to high demand. CUSTOMIZE YOUR OWN WORKSHOP PARTIES! This very popular workshop illustrates the ease and fun of creating your own custom ceramic tiles which can be used for back-splashes, kitchen and bathroom accents, trivets, coasters or beautiful wall hangings. 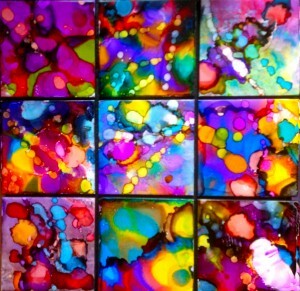 Alcohol inks are dyes which have an isopropyl rubbing alcohol base and can be manipulated in fascinating and unpredictable ways. We will create a beautiful polymer clay vase made with clay appliques over a glass vase*. You will take home a beautifully handcrafted one-of-a-kind unique vase, perfect as a gift for friends and family. Once you learn this easy technique, you’ll want to create a bunch of these colorful and unique gift items. This project will take all of the post-holiday stress away for 2.5 hours. All you need to do is bake it in your home oven according to instructions. *You may also bring your own vase according to shape preference. A cane is created from polymer clay in a long log that can be sliced off and used to make beads, pendants, bracelets and a multitude of projects. Canes have pictures or patterns running through the entire tube length. The making of the cane incorporates the Millefiori style associated with Venetian glassware. This workshop will cover a variety of basic canes including, jellyroll, bulls-eye, striped, checkerboard, and the exciting “Klimt cane”. A fun workshop making fabulous beads with the wonderfully versatile Polymer Clay. Discover the endless possibilities that polymer clay offers for the amateur and professional jeweler. Mix it with metal, found objects, new materials and fibers for astonishing effects. The softness and pliability of polymer clay makes it amenable to texturizing and molding into beads, buttons, figurines or charms. Polymer clay can be sanded for extra smoothness after baking, and painted and glued as needed. We explore and create the basic shapes and baking prep for this workshop.